STARRED REVIEW"What is a reverso? “When you read a reverso down, it is one poem, and when you read it up, it is a different poem.” For example, “The road leads wherever you need to go” becomes “You need to go wherever the road leads” in reverse. Singer and Morton read this collection of 14 original reverso poems based on fairy-tale characters. Singer’s hardcover picture book (included with the CD) features the original and reverso version of one poem on one page, with Josée Masse’s imaginative acrylic artwork on the opposite page. The dual narrators change inflections, intonations, and word emphases to reflect the characters’ thoughts, which reveal different intentions based on word order. In the double reading of “Do You Know My Name?,” Rumpelstiltskin screams his anger, while the princess softly bemoans her fate in reverse order. The audio, featuring gentle original background music and ambient sound effects (cawing crows, howling wolves, snipping scissors, and more), is visually delightful and charmingly narrated. Kids will want to listen over and over to savor the duality of meanings. Hats off to Live Oak for this fresh take on Singer’s time-honored poems featuring Cinderella, Sleeping Beauty, Snow White, and Little Red Riding Hood, among others." STARRED REVIEW "Marilyn Singer's innovative book (Dutton, 2012) presents poetry based on fairy tales that can be read in two ways - the lines can be read from top to bottom and from bottom to top. Crafted in a minimalistic free verse, each set of reversible poems presents the thoughts of characters from various fairy tales. Sometimes the two poems give two points of view of the same character, while other sets represent two different characters in the same fairy tale. 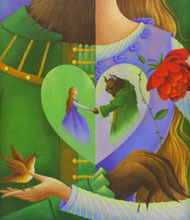 For example, the Cinderella poems portray Cinderella's attitude before and during the ball, while the Red Riding Hood verses are written from the girl's and the wolf's point of view. Each set of poems is illustrated with Josee Massee's stylized acrylic artwork in rich jewel tones. She skillfully incorporates the characters of the poems and the idea of mirror images into each of her illustrations. The female parts are read by the author, while the male characters are voiced by Joe Morton. Both readers skillfully use tempo, expression, and inflection to make the meaning and feeling of the poems clear. Appropriate instrumental background music has been added to each poem. A great choice for a reading/listening center at school, or just for fun." "Author Marilyn Singer explains that her poetic creation called a “reverso” is a poem that can be read top to bottom and bottom to top with (quite) a resulting change in meaning. In MIRROR, MIRROR, she explores a collection of fairy tales in this fashion. Does Sleeping Beauty like being asleep, and does the Prince like searching for the illusive princess? Is the arrival of Goldilocks in the Three Bears’ cottage a big deal? Is the Ugly Duckling an optimistic or pessimistic fellow? As Singer and Morton deliver these thought-provoking stories, it’s amazing how the change in line order and inflection creates varying viewpoints of the tale at hand. Each narrator embraces the task and uses intonation, elongation, enthusiasm, sarcasm, and timing to delight the listener. At the close of the production Singer explains reverso poetry in more detail. A must!"